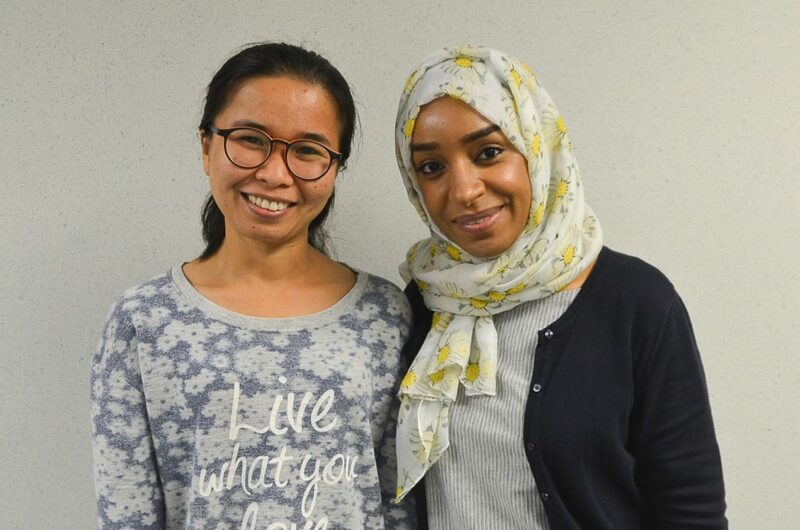 Tipparat Udmuangpia (left) and Reem Al Alawi (right), International Residential PhD students, were selected for membership in Griffiths Leadership Society for Women in Fall 2017. MU SSON offers two PhD program options: Online PhD Option and International Residential PhD Option. The PhD curriculum, program requirements, and program outcomes are the same whether you choose the Online PhD option or the International Residential Nursing PhD option. Only the method of course delivery varies. If you would like additional information after reviewing our webpage, please contact Dr. Deidre Wipke-Tevis. The Online PhD Option is designed to deliver the same quality educational experience as MU’s on-campus programs, and includes opportunities for close interaction with mentors and peers both remotely and in required campus visits. Our Online PhD Option has students from 18 states and 2 foreign countries. MU is a leader in the number of online program offerings; ranking first in the Big 10, second in the Big 12 and SEC, and third among Association of American Universities (AAU) public institutions in the number of distance degree and certificate programs. Our program quality has been recognized by the University Professional and Continuing Education Association who recently honored MU with the 2014 Strategic Innovation in Online Education Award and presented this award for excellence to our graduate nursing program in 2015. Some online courses are completely asynchronous; some are completely synchronous; and some are a mixture of both. Synchronous chats will be on Tuesday evening, Wednesday during the day or Wednesday evening. The one exception is N7010, our first statistics course, which is offered the first summer of your enrollment where the chats are on Tuesday and Thursday evening. A 5-day June On Campus Orientation Intensive is required the first summer of enrollment. 4-Day April On Campus Intensives are required every spring until coursework is completed. These on campus times provide an opportunity for close collaboration with your academic advisor, dissertation committee, and other members of the nursing faculty. Other opportunities for student-to-student and student-to-faculty interaction include the MU SSON Graduate Student Resource & Collaboration Center, Collaborate Ultra online Classroom, Facebook, Skype, and Twitter. International students who need to study from their home country are welcome to apply to the Online option. International online students are also required to attend all On Campus Intensives. Please watch this video about how the Online PhD Option’s flexibility can make it a match for you. The MU Sinclair School of Nursing welcomes international students to an intellectually stimulating doctoral program offered in a supportive environment. International students at the University of Missouri comprise 6 percent of the student population of 34,000 and come from over 100 different countries. In the International Residential PhD Option, we currently have students from three foreign countries. The MU International Center provides support for international students. Language assistance and aid in writing are available through the English as a Second Language Program. Through the International Residential PhD option, international students attend the MU campus hybrid classes in Columbia, Mo. The international students attend the classes in-person, while their online student cohort may participate in-person or electronically through videoconferencing software. International students enroll in traditional residential course offerings on the MU campus. International students must maintain full-time status by enrolling in 9 credits each fall and spring term. Of the 9 credits each term, at least 6 credits must be either traditional face-to-face or hybrid coursework in order to qualify for and retain the student visa status. The remaining 3 credits each term may be taken 100 percent online. International Residential PhD Option students must provide documentation of English-language proficiency, demonstrated through a satisfactory Test of English as a Foreign Language (TOEFL) or International English Language Testing System (IELTS) score within the last two years. English-language proficiency requirements can be found of the MU Graduate Studies webpage. If English Proficiency scores do not meet this level, international applicants are strongly encouraged to pursue Intensive English Program training in the United States prior to retaking the TOEFL or IELTS. MU offers a full-time Intensive English Program (IEP) for any student who cannot meet minimum language requirements for admission to U.S. colleges or universities, or for any student who wishes to study English as a second language. If you are admitted but your English language proficiency is not satisfactory, you will be required to enroll in ELSP courses along with a reduced academic course load. You must pass these courses within the first two semesters of enrollment.